Regardless of whether or not you’ve attended a careers fair before, they can be a bit intimidating. This fair attracts a lot of employers, students and graduates and so is busy. This video, taken at the fair a couple of years ago, will give you an idea of what to expect. Organisations attending will be a mixture of employers – local, national and multinational – course providers, professional bodies and other organisations. You can find the full list of organisations attending here, and see which of them recruit for which types of roles here. As an absolute minimum (if you are looking for jobs), you should have researched the company, their roles and what they look for before the fair. The more research you have done, the better impression you will create; this post gives you tips on how to thoroughly research companies. What does a typical day/ week involve for you? What are the best/ worst things about your your job/ working for this company? What sort of things make applicants stand out for you? Spend some time reflecting on yourself before the fair. Preparing a brief introduction to yourself, or thinking how you would answer a questions such as “Tell me about yourself” can be a great way to make a strong first impression. You introduction should include basic biographical information (name, course), why you’re interested in that organisation/ role and highlight any relevant skills/ experience/ positions of responsibility. This doesn’t need to be everything you’ve ever done, but should be enough to get them interested in you, after which they may well have further questions. Whilst not essential, I would always recommend dressing smartly to attend a fair. Most students attending probably will not, so doing so instantly sets you apart and will convey a sense of professionalism and that you are taking the opportunity seriously. If you can, full suit or formal attire is best but if this is not possible, then a smart and tidy appearance will put you in good stead. To CV or not to CV? In the run-up to fairs we get lots of students asking whether or not they should take copies of their CV. This is really an individual choice. Larger employers are likely to have their own application systems so many will not consider CVs on the day. Smaller organisations might be more willing to consider CVs on the day, although there are no definite rules. It could be a good idea to prepare some copies of your CV to take with you in case companies are interested in receiving them, but don’t be surprised if they just direct you to an online application system. If you are taking a CV, make sure you target it as much as possible to the types of role in which you are interested. See our website for more detailed guidance on writing a CV. Whilst it can be tempting to just whizz around the fair grabbing brochures and freebies, you will get a lot more out of the fair if you actually speak to representatives on the day. Take a look at these posts from Leeds students and graduates Catherine, Grant, Tom and Hannah about how attending careers fairs and events helped them. If you have a good conversation with a representative on the day, ask if you can take their contact details – this could be invaluable if you later decide to apply. Whilst planning and research before the event are invaluable, it can also be useful to keep a bit of an open mind on the day. You may come across organisations of which you were previously unaware but which sound brilliant when you speak to them. If you have no ideas about what you want to do, fairs can also be a really valuable source of inspiration. Take the time to make a few notes about what you discovered on the day; which organisations sounded appealing and why, any tips they gave you, who you spoke to (and contact details if you got them). Also go through any brochures or material you picked up and use this to help inform your next steps; e.g. are you planning to apply? Did it change your mind about any organisations? Has it given you new ideas to consider? This is where having contact details is incredibly useful. If you spoke to someone and they shared their contact details, drop them an e-mail a few days after the fair thanking them for their time at the fair. If you have any questions after reflecting on the fair, this is also a great opportunity to ask them. If shows you are enthusiastic and interested. Whilst approaching an organisation at a fair can be daunting, it needn’t be. Remember that the organisations are there because they are interested in meeting students like you. Many will have been in your situation quite recently so are likely to understand how you’re feeling. If you have any questions on the day, we will have a query desk by the entrance in hall one and there will also be staff throughout the fair. 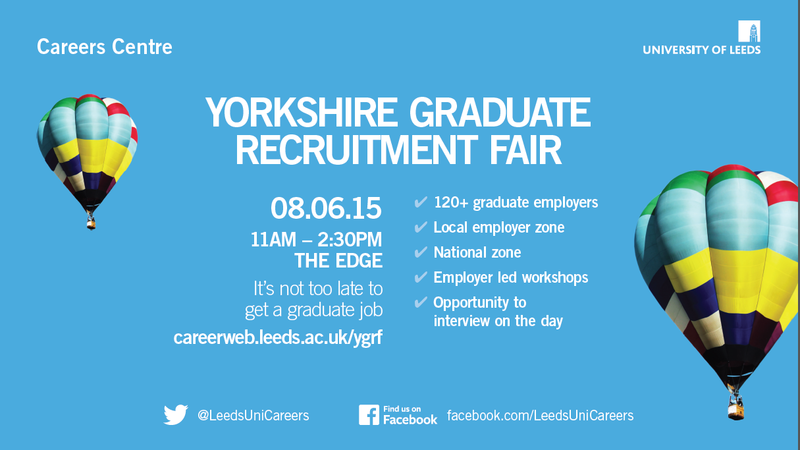 We are using #YGRF15 for the fair – look out for fair-related tips and feel free to tweet us any questions about the fair @leedsunicareers or by commenting below. We’d also love to hear your thoughts and comments on the day. As always, you can also use our drop-in service which is open 9am-4pm Monday-Friday.